Slider windows have a sash that slides back and forth to open horizontally. This type of window is particularly popular in homes and other buildings with relatively low ceilings, or when the owner just wants a different look from the standard double-hung or single-hung windows. 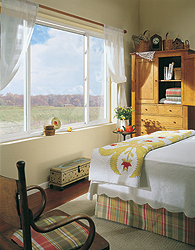 The sliding windows installed by the home improvement specialists from Shiner Roofing, Siding and Windows are manufactured by Sunrise, one of the leading window makers in the country. Shiner was founded in 1981, and has served the Washington, D.C. region with distinction for more than three decades. We are licensed, bonded, and fully insured in Virginia, Maryland, and D.C. We also are a family-owned and -operated home improvement contractor with a superb reputation throughout Northern Virginia, Maryland, and the District of Columbia. We consistently receive a rating of A+ from the Better Business Bureau, and we’re proud of our customer reviews on Angie’s List. Contact Shiner today to request a quote on new slider windows for your home or commercial building in McLean, VA, Great Falls, Vienna, Arlington, Oakton, Alexandria, Falls Church, Potomac, MD, Leesburg, Bethesda, and communities throughout Northern Virginia, Maryland, and Washington, D.C.